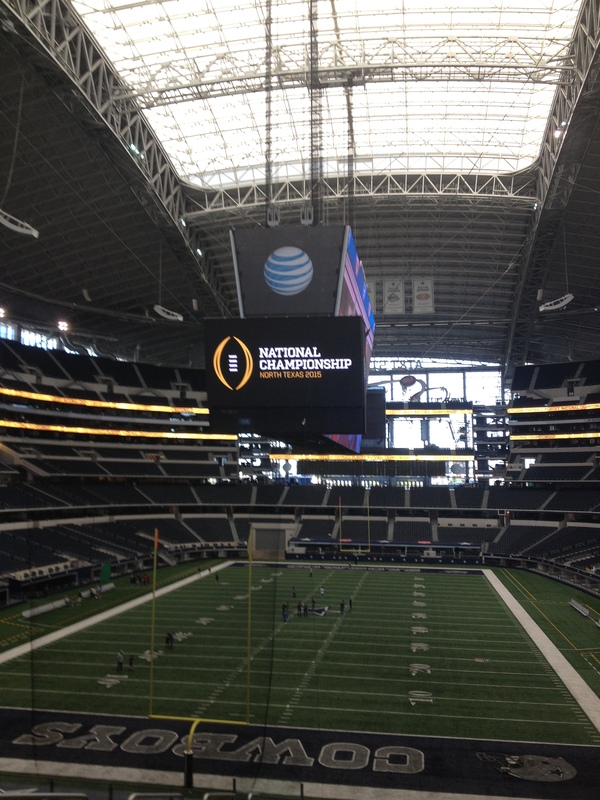 AT&T Stadium in Arlington, Texas, site of the first College Football Playoff championship game on Jan. 12. The College Football Playoff celebrated the 75-day marker before the national title game on Jan. 12, 2015, at AT&T Stadium in Arlington, Texas. Dallas Cowboys owner Jerry Jones, ESPN College Football analyst and former Texas head football coach Mack Brown and College Football Playoff Executive Director Bill Hancock were among the speakers at a luncheon on Oct. 29 at the stadium. The night before the CFP’s 12-member Playoff Selection Committee released its first 25-team poll. The poll will appear weekly on Tuesdays through early December . The CFP’s Selection Committee’s last poll will be announced on Dec. 7, when the national semifinal pairings will be set for the Sugar and Rose Bowls, both to be played on Jan.1 , 2015. The Football Writers Association of America will hold several events at the national title game site Jan. 9-13. The FWAA’s Annual Award Breakfast will be on Tuesday Jan. 13, the morning after the title game, at the media hotel in Dallas, the Renaissance, in conjunction with the CFP’s press conference with the winning team.